Luckily, Sauers will work with you before the winter season strikes making that second question obsolete. 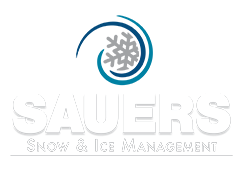 Sauers helps you think through potential Winter Weather events and develops a scope of work for us to follow that will keep your property managed to your expectations. During our consultation, we’ll discuss the common pricing structures to develop a snow removal cost and snow and ice management proposal. Every property type may have different needs and expectations when it comes to managing and budgeting snow removal costs. The following pricing structures are based on your Level of Service Assessment that we develop together. The structure is simply how you can choose to pay for that Level of Service to be performed throughout the Winter. Did you know? Since our regional coverage is in a volatile weather area, most of our clients prefer the seasonal fixed rate. If the weather forecasts a snow heavy winter, you’ll comfortably never go over budget. Whereas for the light snow seasons, you’ll still have a budget-friendly and consistent snow removal cost. Call 215-659-1613 or fill out this form to request a proposal.